*Address correspondence and reprints request to: Gholamreza Veghari, Department of Nutrition, Golestan University of Medical Sciences, Iran. Veghari G, Mansourian A, Abdollahi A. Breastfeeding Status and Some Related Factors in Northern Iran. Oman Med J 2011 Sept; 26(5):342-348. Objectives: The main objective of this study is to assess the Breastfeeding Duration, Exclusive Breastfeeding Duration and other related factors among children aged less than 5 years old in rural areas of Northern Iran. Methods: This is a descriptive cross-sectional conducted on 2520 children aged 6-60 months (male: 1309, female: 1211) chosen by cluster random sampling from 20 out of 118 villages. Data were collected from mothers using a questionnaire. The duration of breastfeeding was computed only for children aged over 24 months old. Breastfeeding duration and Exclusive Breastfeeding Duration were classified based on WHO definition. SPSS Version 16 was used for data analysis. Results: The mean Exclusive Breastfeeding Duration was 5.59 months, while 66.4% of children had exclusive breastfeeding for at least 6 months. The lowest Exclusive Breastfeeding Duration and the highest Breastfeeding Duration were observed among the Turkman ethnic group. Exclusive Breastfeeding duration of at least 5 months was 14.6%, thus the results were significantly higher than in the Turkman ethnic group (p=0.001). Meanwhile, the results showed that exclusive breastfeeding duration significantly increased with maternal education level (p=0.004). The study found that the mean breastfeeding duration was 20.6 months, and 89.3% and 74.7% of children were breastfed for at least 18 and 24 months, respectively. A positive correlation was reported between breastfeeding duration and family size, birth order, maternal age and children nutritional status, (p<0.05). Additionally, lactation period in underweight children was significantly higher than in obese children, (p=0.023). Conclusion: The study found that two-thirds of children exclusively breastfed during the first six months of life and the mean breastfeeding duration was 20.6 months. While both exclusive breastfeeding duration and breastfeeding duration were influenced by socio-demographic factors in the rural areas of Northern Iran. Keywords: Breastfeeding; Rural; Socio demographic factors; Iran. Of the 1,600,000 population in the Golestan province (Northern Iran), 7% are under five years old, whereas 43.9% and 56.1% live in urban and rural areas respectively.15 Agriculture is the main occupation in the rural area, which is inhabited by different ethnic groups, namely; Fars-native, Turkman and Sistani. Due to restrictions in executing epidemiological projects, there has not been any study examining breastfeeding status in this area until now. The aim of this study is to investigate the BFD and EBFD and other related factors, such as maternal age, maternal BMI, economic status, level of education, parent’s occupation, family size, birth order, children nutritional status and ethnicity in Norther Iran. This is a descriptive cross-sectional study conducted during a three-month study period on 2520 children aged between 6 and 60 months (male: 1309, female: 1211) in the rural regions of Northern Iran. The study was orchestrated by healthcare workers. The study participants were selected using the cluster random sampling technique. Of the 118 villages, 20 villages were randomly selected as cluster and all children aged between 6 and 60 months were included in the study. Data on children’s age, maternal age, economic status, ethnicity, maternal BMI, and maternal education were collected from the mothers using a questionnaire. BFD was computed only for children aged over 24 months old, but EBFD was computed for all cases. SPSS.16 was used for data analysis. The data were analyzed using the variance (ANOVA) and t-test to compare the means between the two groups, and the chi-square test was used to compare the frequencies between the two groups. A p value <0.05 was considered statistically significant. The reliability test showed that the Cronbach's Alpha value was 0.84 for the attributes tested. EBFD was classified based on WHO,16 definition. WHO defined exclusive breastfeeding as; "the infant has received only breast milk from his /her mother or a wet nurse, or expressed breast milk, and on other liquids or solids with the exception of drops or syrups consisting of vitamins, mineral supplements or medicines." In this study, ethnicity was defined as follows: 1) Fars-native ethnic group: People residing in Northern Iran over very long periods of time and are considered to be the native residents. 2) Sistani ethnic group: People who immigrated to this region from the Sistan and Bluchestan Province (South-Eastern Iran) during the past decades. 3) Turkman ethnic group: This group does not have any family relation with the other ethnic groups, and can therefore be considered as an independent race which resides in a particular rural area. Based on Iranian educational grades; the parents’ educational levels are classified in terms of years of schooling. The data analyses includes three educational levels; Illiterate (without schooling), 1-12 schooling years (low educated), beyond high school (>12 years schooling or college). While the father’s job was categorized into two occupational groups; employed and unemployed. On the other hand, nutritional status was divided into three categories according to Mclaren: Malnutrition, normal, overweight or obese.19 If a mother is unable to breastfeed her baby despite her wishes, it is considered breastfeeding failure. Maternal Body Mass Index (BMI) was defined based on categories from the WHO reference values.20 Unwilling mothers and those who could not remember their children’s breastfeeding conditions were excluded from the study. The results from this study showed that of ethnic groups included in this study, 21.9% were Fars (native), 36.2% were Turkman, and 40.6% were Sistani, while 1.3% accounted for other ethnic groups. In terms of the economic status; 38.5% of the studied group were poor, 55.5% were moderate, and only 6% exhibited good economic status. The results also revealed that 96.3% of mothers were housewives. Thus, other jobs and activities were not considered. The results for EBFD and other related factors are presented in Table 1. The findings revealed that 40 of the studied children were not breastfed. The mean of EBFD was found to be 5.59 months and exclusive breastfeeding rates for five and six months were 83.8% and 66.4%, respectively. With respect to family size; the mean EBFD in family size of <5 was significantly higher than in a family size of ≥5, (p=0.001). Additionally, the prevalence of EBFD of at least 5 months was significantly higher by up to 11.4% in a family size of <5, (p=0.001). On the other hand, the mean EBFD among Fars-native, Turkman and Sistani ethnic groups was significant (p=0.001), while the duration of EBFD in the Turkman ethnic group was less than the other ethnic groups. However, EBFD of at least 5 months in the Fars-native group (94.2%) was 14.6% higher than in the Turkman group (79.6%), thus the difference was statistically significant (p=0.001). In addition, there was a positive correlation between EBFD and maternal education level (p=0.004). The results also showed that 94.7% of college educated mothers fed their children for at least five initial months of life. Despite the fact that no significant correlation was observed between maternal age and EBFD, the chi-square test was significant between the two maternal age groups (≤25 and 36≤ years) whose children were exclusively breastfed for at least 5 months, (p=0.001). However, the ANOVA test did not reveal any statistically significant difference between EBFD and birth order, father’s occupation, maternal BMI, maternal age or the children’s nutritional status. BFD and other related factors are presented in Table 2. The mean and standard deviation for BFD was 20.6±7.6 months and the duration of breastfeeding for at least 12 and 18 months of age were 89.3% and 74.7%, respectively. There was a significant correlation between BFD and family size, birth order, maternal age and children’s nutritional status (p<0.05). A significant statistical difference was observed between the two family size groups (<5 and 5≤) based on 18 months breastfeeding duration (p=0.032). Note: Forty cases have not breast-feeding. * Hoc test is not significant. ** Hoc test is significant between Fars and Turkman and between Turkman and Sistani, (p<0.001). Note= Under 2 years old children exclude in this section. Forty cases have not breast-feeding. *Hoc test is not significant. ** Hoc test is significant between ≤25and 26-35 years age groups.(p<0.013). *** Hoc test is significant between Malnutrition and overweight groups.(p<0.03). The results showed that BDF was higher in the Turkman ethnic group compared to the other groups but the differences between BFD among the three ethnic groups (Fars-native, Turkman and Sistani) was not significant. However, the difference among the different ethnic groups and BFD for 18 months was significant, (p=0.003). On the other hand, The duration of breast-feeding among mothers aged between 26 and 35 years was longer than the other age groups, but BDF of at least 18 months among mothers aged over 36 years was significantly higher than other age groups (p=0.005). In thinner children, BFD was found to be higher than in overweight and obese children, in addition, breast-feeding for at least 18 months duration was significantly higher (12.5%) in this group than in normal or obese groups, (p=0.023). The most significant risk factors of breast-feeding failure are presented in Fig. 1. Based on the mothers’ reports; insufficient milk supply (36%), the child’s lack of interest (30%) and pregnancy (17%) were the most frequently reported factors for breast-feeding failure. 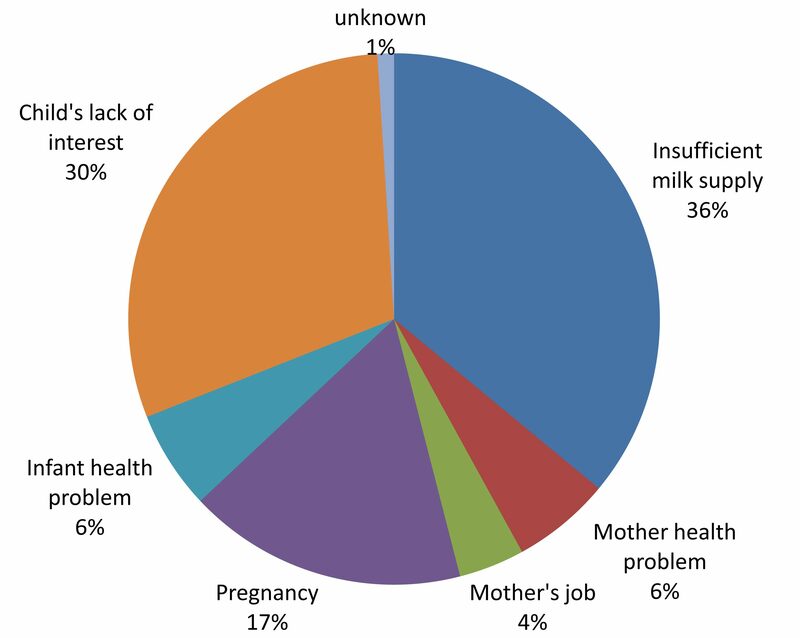 Figure 1: The most reasons for breast-feeding failure in Northern Iran. Another study conducted in Iran (2000) described that exclusive breast-feeding duration had decreased from 44% to 27% over the last years.13 In comparison to the aforementioned studies, EBFD and BFD status in Northern Iran was better than other parts of Iran. The duration of breast-feeding in South-Asian Countries such as Bangladesh,22 India,23 and Sri Lanka,24 were reported as 28.2, 18.4, 21.8 and 23.2 months, respectively. According to the World Health Organization report,25 children fed exclusively on breast milk for six months in Eastern Mediterranean countries, including Pakistan, Iraq, Saudi Arabia and Egypt was 16%, 25%, 31% and 38%, respectively. In the current report, exclusive breast-feeding for at least six months was 66.4%. Compared to other studies, EBFD of at least six initial months of life in children of Northern Iran was appropriate. Iran is a Muslim country and breast-feeding is highly emphasized in Islam. The breast-feeding policy is encouraged by the government, and is enforced by the "Breastfeeding Leave Law" in Iran. Thereby, employed mothers who are pregnant can leave work for two months before and for four months after childbirth without any problem. The father's occupation and economic status did not have any correlation with either EBFD or BFD in our study. However, other studies reported that lactation period was low in household women with poor economic status.29,30 In Ontario, Evers et al. found that low income women who were successful at breast-feeding, were better educated and more likely to go to prenatal classes.31 Our study was conducted in a rural area and all the villages were covered by national Primary Healthcare. Based on the Iranian health policy, heath workers should follow up on breast-feeding mothers. Therefore, it can positively influence the breast-feeding rate of Northern Iran. Rural mothers in Iran are mostly housewives, as shown in this study (96.3%), therefore it was not necessary to investigate other occupations. In the present study, the exclusive breast-feeding duration was shorter in the Turkman ethnic group compared to the other ethnic groups, but breast-feeding duration was generally longer in the Turkman group compared to the other groups. In the meantime, socio-demographic factors were different among the three ethnic groups but it was better than in Fars-native ethnic group. The Turkman ethnic people have traditional costumes and their language is not Persian, while the Sistani ethnic people have immigrated from the South East to Northern Iran, and did not have a good socio-economic situation. Researchers believe that racial factors influence nutritional status. Veghari and Golalipour,32 in the north of Iran announced that nutritional status in Turkmen children was better than in Fars-natives and Sistani children, while the pattern of obesity,17 and anemia,18 in Turkmen women was different from the others. The association between maternal BMI and EBFD and BFD in the present study is different from the findings of others studies. Unlike the current study, the results from other studies reported that obese women were less willing to have early breast-feeding.34,35,38,39 In Northern Iran, all the villages are under the management of the National Primary Health Center, where health workers conduct training and implement of the breast-feeding policy. Consequently, this strategy affects both EBFD and BDF to a greater extent than maternal BMI. The results from studies across the world in view of the relationship between educational level and BFD have not yielded similar results. Rakhshani and Mohammadi reported the level of education to be a risk factor for breast-feeding continuation.40 While Huus et al. found in their study, that short term exclusive breast-feeding was less common if one of the parents had university education.38 On the other hand, Wijndaele et al. found strong evidence of association between early weaning and low maternal education.41 Furthermore, another study investigating the continuation of breast-feeding and educational background found that education-related differences were factors affecting the start of breast-feeding.42 However, in the current study; the results suggest that higher maternal education was associated with increased EBFD. But at the same time, high maternal education was correlated with decreased BFD, thus these findings were inconsistent with the aforementioned studies. Overall, the study found that two-thirds of the children were exclusively breast-fed for at least six months and the mean BFD was 18 months. The parent’s educational level exhibited a negative correlation with BFD. At the same time as, the Turkman ethnic group exhibited the shortest exclusive breast-feeding duration, while accounting for the longest breast-feeding duration compared to the other ethnic groups. No correlation was observed between exclusive breast-feeding duration and birth order, father’s job, maternal BMI or the children’s nutritional status. However, birth order, maternal age and children’s nutritional status were related to lactation period. The overall outcome of this study suggests the need to implement suitable policies and public health programs in order to increase and enhance breast-feeding in Northern Iran. Despite the fact that the study highlights the breast-feeding status and some related factors in the rural areas of Northern Iran, not all the related factors such as accommodating baby friendly hospitals, delivery status and breast-feeding status in urban areas are included in this study. At present, baby friendly hospitals are neither significant nor well established in Iran, compared to other well established hospitals in developing countries. The authors would like to thank the medical and administrative staff at the Primary Health Care Centers of Golestan University of Medical Sciences for their valuable assistance during the field work. Also, the Research Deputy of the University is thanked for supporting this project financially. 1. Nurturing the future: challenges to breastfeeding in the 21st century; 23-27 September 2002, Arusha, Tanzania. Penang: World Alliance for Breastfeeding Action; 2004. 2. Innis SM. Perinatal biochemistry and physiology of long-chain polyunsaturated fatty acids. J Pediatr 2003 Oct;143(4)(Suppl):S1-S8. 3. Lawrence RA. Infection, allergy, and the protection from breastfeeding. Breastfeed Med 2009 Mar;4(1):1-2. 4. Hylander MA, Strobino DM, Dhanireddy R. Human milk feedings and infection among very low birth weight infants. Pediatrics 1998 Sep;102(3):E38. 5. Furman L, Taylor G, Minich N, Hack M. The effect of maternal milk on neonatal morbidity of very low-birth-weight infants. Arch Pediatr Adolesc Med 2003 Jan;157(1):66-71. 6. Lee JS, Polin RA. Treatment and prevention of necrotizing enterocolitis. Semin Neonatol 2003 Dec;8(6):449-459. 7. Sisk PM, Lovelady CA, Dillard RG, Gruber KJ, O’Shea TM. Early human milk feeding is associated with a lower risk of necrotizing enterocolitis in very low birth weight infants. J Perinatol 2007 Jul;27(7):428-433. 8. Vohr BR, Poindexter BB, Dusick AM, McKinley LT, Wright LL, Langer JC, et al; NICHD Neonatal Research Network. Beneficial effects of breast milk in the neonatal intensive care unit on the developmental outcome of extremely low birth weight infants at 18 months of age. Pediatrics 2006 Jul;118(1):e115-e123. 9. Shaikh U, Ahmed O. Islam and infant feeding. Breastfeed Med 2006;1(3):164-167. 10. Thulier D, Mercer J. Variables associated with breastfeeding duration. J Obstet Gynecol Neonatal Nurs 2009 May-Jun;38(3):259-268. Available from URL. 11. Modanlou HD. Avicenna (AD 980 to 1037) and the care of the newborn infant and breastfeeding. J Perinatol 2008 Jan;28(1):3-6. 12. Raisler J, Alexander C, O’Campo P. Breast-feeding and infant illness: a dose-response relationship? Am J Public Health 1999 Jan;89(1):25-30. 14. Marandi A, Afzali HM, Hossaini AF. The reasons for early weaning among mothers in Teheran. Bull World Health Organ 1993;71(5):561-569. 15. Statistical Center of Iran .Population and Housing Census. Available from URL: [http://www.sci.org.ir]. 16. World Health Organization, ed. Indicators for Assessing Breast-feeding Proctices.Geneva: World Health Organization, 1991. 17. Veghari G, Azadreza M. Obesity Among Mothers In Rural Golestan-Iran (south – east of Caspian sea). Iran J Public Health 2007;36(3):71-76. 18. Gholamreza V. Anemia in north of Iran (south-east of Caspian Sea). Pak J Biol Sci 2007 May;10(10):1703-1707. 19. McLaren DS, Read WW. Weight/length classification of nutritional status. Lancet. 1975; 2;2(7927):219-21. 20. Obesity WH. Preventing and managing the global epidemic.WHO/NUT/98. Geneva, witzerland: World Health Organization 1998. 21. Olang B, Farivar K, Heidarzadeh A, Strandvik B, Yngve A. Breastfeeding in Iran: prevalence, duration and current recommendations. Int Breastfeed J 2009;4:8. 22. Mannan HR, Islam MN. Breast-feeding in Bangladesh: patterns and impact on fertility. Asia Pac Popul J 1995 Dec;10(4):23-38. 23. Rajaretnam T. Trend and differentials in breast-feeding and amenorrhea durations in a rural area in south India. Demogr India 1994;23:83-95. 24. Mahler K. Women breast-feeding infants longer in many developing countries. Int Fam Plan Perspect 1996;22:134-135 . 25. The state of the world's children. 2008, [Child survival]. New York: Unicef; 2007. 26. Simard,l., O’Brien, H. T., Beaudoin, A., Turcotte, D., Damant, D., Ferland, S.,et al. Factors influencing the initiation and duration of breastfeeding among low-income women followed by the Canada prenatal nutrition program in 4 regions of Quebec. J Hum Lact, 2005; 21(3): 327-337. 27. Adams C, Berger R, Conning P, Cruikshank L, Doré K. Breastfeeding trends at a Community Breastfeeding Center: an evaluative survey. J Obstet Gynecol Neonatal Nurs 2001 Jul-Aug;30(4):392-400. 28. Li R, Ogden C, Ballew C, Gillespie C, Grummer-Strawn L. Prevalence of exclusive breastfeeding among U.S. infants: The third national health and nutrition examination survey (Phase II, 1991-1994). Am J Public Health 2002 Jul;92(7):1107-1110. 29. Dennis CL. The breastfeeding self-efficacy scale: psychometric assessment of the short form. J Obstet Gynecol Neonatal Nurs 2003 Nov-Dec;32(6):734-744. 30. Coulibaly R, Séguin L, Zunzunegui MV, Gauvin L. Links between maternal breast-feeding duration and Québec infants’ health: a population-based study. Are the effects different for poor children? Matern Child Health J 2006 Nov;10(6):537-543. 31. Evers S, Doran L, Schellenberg K. Influences on breastfeeding rates in low income communities in Ontario. Can J Public Health 1998 May-Jun;89(3):203-207. 32. Veghari G, Golalipour M. The Comparison of Nutritional Status Between Turkman and Non-Tutkman Ethnic Groups in North of IRAN. Journal of Applied Sciences 2007;7(18):2635-2640 . 33. Forste R, Weiss J, Lippincott E. The decision to breastfeed in the United States: does race matter? Pediatrics 2001 Aug;108(2):291-296. 34. Liu J, Smith MG, Dobre MA, Ferguson JE. Maternal obesity and breast-feeding practices among white and black women. Obesity (Silver Spring) 2010 Jan;18(1):175-182. 35. Jevitt C, Hernandez I, Groër M. Lactation complicated by overweight and obesity: supporting the mother and newborn. J Midwifery Womens Health 2007 Nov-Dec;52(6):606-613. 36. Loiselle CG, Semenic SE, Côté B, Lapointe M, Gendron R. Impressions of breastfeeding information and support among first-time mothers within a multiethnic community. Can J Nurs Res 2001 Dec;33(3):31-46. 37. Harley K, Stamm NL, Eskenazi B. The effect of time in the U.S. on the duration of breastfeeding in women of Mexican descent. Matern Child Health J 2007 Mar;11(2):119-125. 38. Huus K, Ludvigsson JF, Ensk‰r K, Ludvigsson J. Exclusive breastfeeding of Swedish children and its possible influence on the development of obesity: a prospective cohort study. BMC Pediatr.2008; 9;8:42. 39. Donath SM, Amir LH. Maternal obesity and initiation and duration of breastfeeding: data from the longitudinal study of Australian children. Matern Child Nutr 2008 Jul;4(3):163-170. 40. Rakhshani F, Mohammadi M. Continuation of breastfeeding: is this a problem in Southeast Iran? Breastfeed Med 2009 Jun;4(2):97-100. 41. Wijndaele K, Lakshman R, Landsbaugh JR, Ong KK, Ogilvie D. Determinants of early weaning and use of unmodified cow’s milk in infants: a systematic review. J Am Diet Assoc 2009 Dec;109(12):2017-2028. 42. van Rossem L, Oenema A, Steegers EA, Moll HA, Jaddoe VW, Hofman A, et al. Are starting and continuing breastfeeding related to educational background? The generation R study. Pediatrics 2009 Jun;123(6):e1017-e1027. 43. Scott JA, Binns CW. Factors associated with the initiation and duration of breastfeeding: a review of the literature. Breastfeed Rev 1999 Mar;7(1):5-16. 44. Kuan LW, Britto M, Decolongon J, Schoettker PJ, Atherton HD, Kotagal UR. Health system factors contributing to breastfeeding success. Pediatrics 1999 Sep;104(3):e28. 45. Wambach, K.,Campbell, S. H.,Gill, S. L., Dodgson, J. E., Abiona,T.C., & Heinig, M. J. Clinical lactation practice: 20 years of evidence. J Hem lact. 2005;21(3):245-58. 46. Hill PD, Humenick SS. Insufficient milk supply. Image J Nurs Sch 1989;21(3):145-148. 47. Binns CW, Scott JA. Using pacifiers: what are breastfeeding mothers doing? Breastfeed Rev 2002 Jul;10(2):21-25.